A template for novels. Export an eBook completely ready for publishing (e.g. for Amazon-KDP or SmashWords) with just one click! > quotation paragraph, poem, song-text etc. within a text (both left and right indented). Use "Shift+Enter" for paragraphs within the quotation. Note: You can upload the .epub-file to Amazon KDP as Ulysses has exported it – no need to convert! Amazon KDP will automatically convert it into an identical-looking .mobi-file during the upload-process. 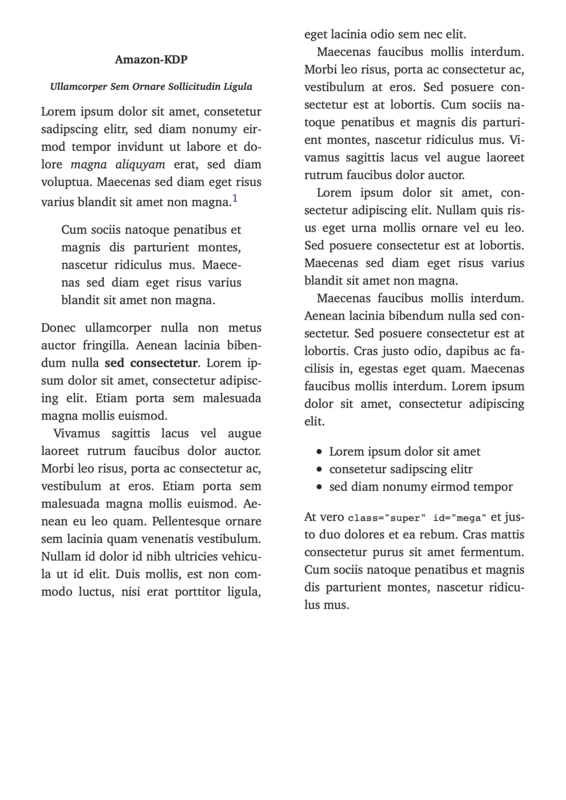 I've made another template for print-ready PDFs (look for: CreateSpace 5.06"x7.81"), which follows the same markup-conventions, so you'll get both files (.pdf and .epub) ready for publishing from of the same Ulysses-Text – without any modifications!